I was a fussy eater and I still am sometimes (can't eat green things). But I do enjoy everything else. It's like a celebration in my mouth. When it's health food - I Eat to Live. When its dessert / fried - I Live to Eat. 80% of my meals are not salad-like and so I make up for it by doing Yoga 3 times a week. So when I found this, I was obviously very amused. Two of my loves = food ♥ yoga. I hope to make these someday. I wish I could cook. And well too. I don't think making maggi and papad really allow me to call myself a chef. And after my papad episode, I quit eating it forever (for now). I've tried helping my mother make rotis since I was a child but for some reason my hands itch when I try rolling the dough. No, it's not an excuse. Also, I'm very scared of fire. And that's not even a lie. Ask my friend Shivani. She lit the Bunsen burner for me in Chemistry class for two whole years in school. What can I say? Life is hard. It's going to take a while for you to be born out of my kitchen. 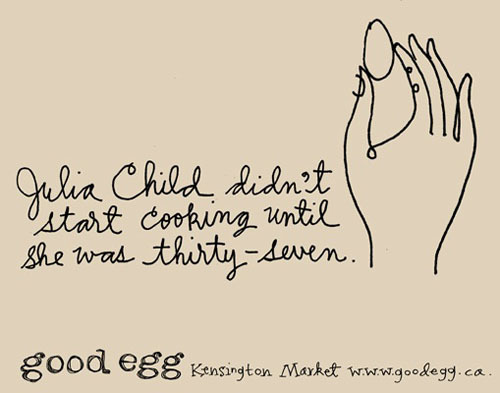 from spoilt child to julia child? haha.